What is Shwmae Sumae Day? With Shwmae Su’mae Day only days away and hundreds of events scheduled across the country and beyond, everyone can be part of the conversation. Be part of something big by greeting each other in Welsh on Saturday 15 October. A single Shwmae or Su’mae could spur hundreds and thousands more throughout the year, making sure Wales is well on its way to reaching a million Welsh speakers. “Diwrnod Shwmae Su’mae is a day to celebrate the Welsh language – and to maximise the opportunities to use it – by greeting people in Welsh at the beginning of the conversation, rather than thanking them in Welsh at the end! The campaign has plenty of high profile supporters. Artist and former pop-singer Swci Delic will make sure the campaign gets noticed, using her trademark mix of vibrant colours and patterns. “I’m thrilled to be a Shwmae Su’mae champion. I decided to help spread the word by doing what I love to do – paint. I wanted to create something special to celebrate this unique Welsh day. “By starting every conversation with Shwmae or Su’mae (Hello, how are you), who knows where the conversation will take you? Residents of Swci’s hometown of Carmarthen will be in for a surprise on Friday evening, as the art is projected on to the town’s county hall. Postcards featuring the eye catching artwork will be available at events across the country on Saturday. As Shwmae Su’mae Day falls on a Saturday this year, many workplaces, schools and colleges celebrate on Friday. This gives many children and young people the opportunity to celebrate twice. Some schools, including Pontypridd High School, will dedicate a full week to the occasion. Babies in Cardiff can enjoy the scenery whilst parents push prams and chat in Welsh around Roath Lake. National Children’s Poet, Anni Llŷn, calls for schools to compete in a poetry competition. Students at Bridgend College will make noise in Clogs Fit classes. Balloons with special Shwmae messages will be released from Porthcawl Pavilion. Coffee mornings from Wrexham to Caerphilly. Awards for learners in Pembrokeshire. A festival for learners in Llandrindod. An evening of soup and song in Dolgellau. Bag a bargain from businesses offering a discount to customers who say Shwmae. Full list on the events page. Former Welsh Learner of the Year finalist at the National Eisteddfod and Shwmae Su’mae champion, Ashok Ahir, demonstrates that working in Welsh is good for business. He is a Director of PR company, Mela, who take pride in offering a bilingual service and are instrumental in the FAW’s successful Together Stronger campaign. “Take it one step at a time. Start with Shwmae, don’t worry about the rest of the conversation. When I started I would often mix Welsh and English words. This is a normal part of learning that improves with practice. Contact details for all the mentrau iaith can be found on the Mentrau website (www.mentrauiaith.cymru/dod-o-hyd-i-fenter). Many thanks to Caren, Linda, Archie and the Cwmni Da crew for putting this special clip together. 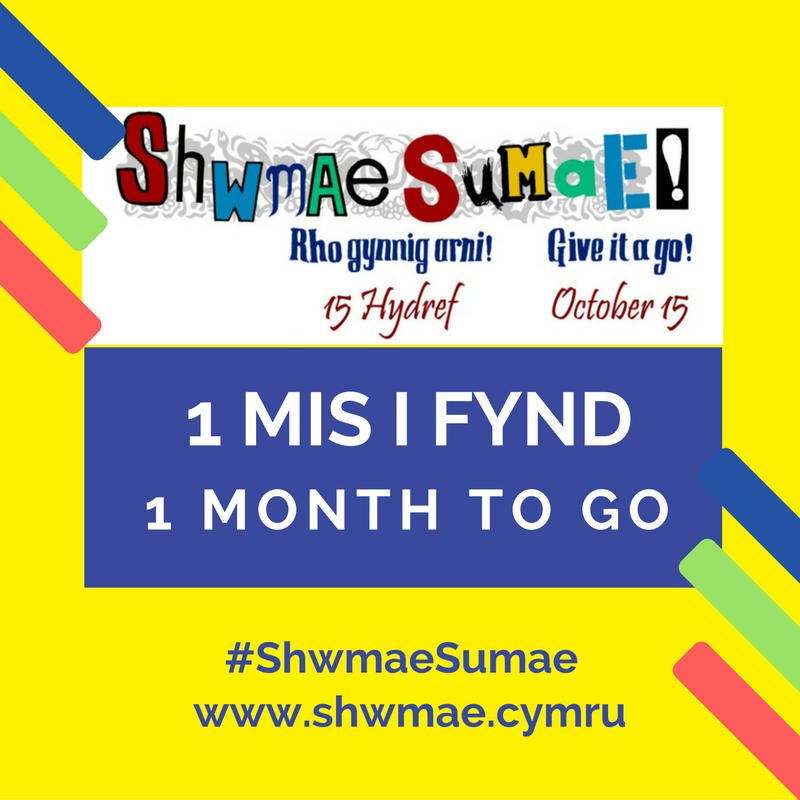 Only a week to go until Diwrnod Shwmae Su’mae on Saturday 15 October. 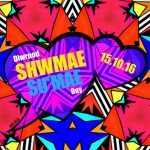 People all over Wales and beyond will greet each other with a Shwmae, Su’mae, Shwdi or S’mai and get together to celebrate the language. Give it a go, be a part of the story. Shwmae Su’mae is pleased to add Ashok Ahir to its list of champions. Ashok carved a career as a journalist, editor and programme maker at the BBC before becoming a Director of Mela, a bilingual PR and Communications company, based in the Hen Lyfrgell, Cardiff. 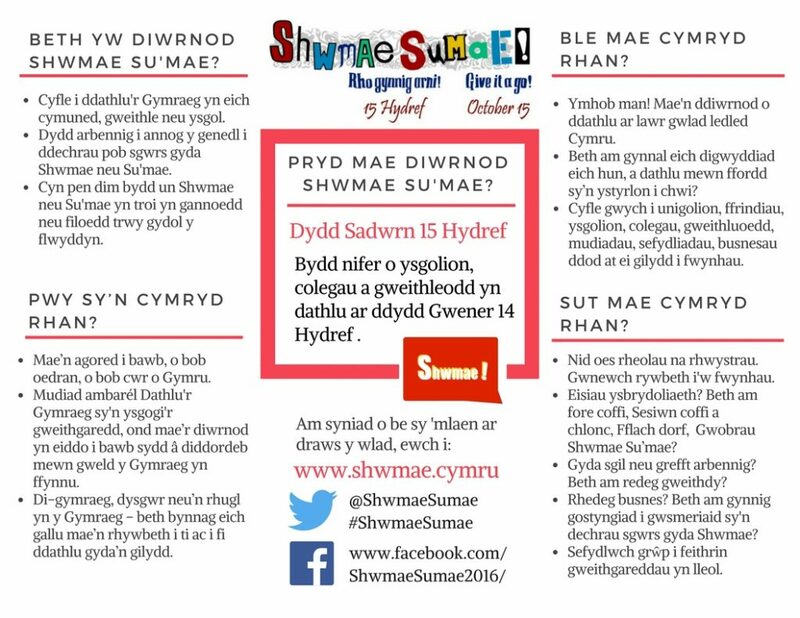 “Shwmae Su’mae is a great way of influencing and encouraging people to use Welsh every day by showing how easy it can be. “Most importantly, it’s an opportunity to celebrate in a natural environment, in the community. A former Welsh Learner of the Year finalist at the National Eisteddfod, Ashok proves that practice and perseverance pays off. 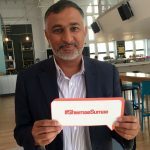 Ashok will be working closely with Shwmae Caerdydd to help facilitate and nurture a number of events throughout the capital. Shwmae Su’mae Champion is the latest addition to Ashok’s long list of accolades, which also includes a BAFTA Cymru award. 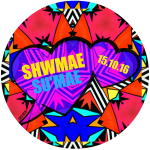 Shwmae Su’mae day on Saturday 15 October will not go unnoticed as a psychedelic piece of art has been created to mark the occasion. Artist and Shwmae Su’mae champion, Swci Delic, set about creating a special piece that is certain to grab attention using her trademark mix of vibrant colours and patterns. Swci’s eye catching artwork will be a key feature of this year’s Shwmae Su’mae campaign. A limited number of postcards featuring the special design will be available at numerous events across the country on 15 October. It will also be shared widely on social media. “I was thrilled to be invited to champion Shwmae Su’mae Day. I decided I would show my support and help spread the word by doing what I love to do – paint. I wanted to create a memorable reminder that would make people smile. “The Welsh language is so important to me. Being a part of this campaign is exciting as it is about celebrating, together. It doesn’t matter if you are fluent, a learner or don’t speak Welsh at all – anyone can try a Shwmae or Su’mae. Greeting each other in Welsh is a small gesture, but, if we all do it every day, everywhere we go it has the potential to have a huge impact. Before she started painting Swci Delic (real name Mared Lenny) was a successful singer. 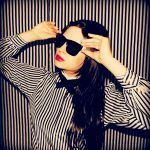 During a three year career as award-winning Welsh language singer Swci Boscawen, she released three singles and an album. The music came to a sudden end when she collapsed with a brain tumour. After intense treatment, Swci developed an inexplicable urge to start – and never stop – painting. Bold, large and colour-clashing, her crazy canvases give a vivid glimpse into the chaotic condition of a brain fighting cancer. Having never painted before, she is a firm believer in giving it a go. Her enthusiasm and positivity are bound to inspire. “Give it a go! Get your friends together on Shwmae Su’mae day to do something you enjoy. You never know where one Shwmae could lead”. The names of the remaining champions will be revealed soon. What is Shwmae Su’mae Day? Want to organise an event? There are resources/ adnoddau available to help. If in need of inspiration, or want to know more about what’s on in your area, there are a number of ideas on our events page, on Facebook ( www.facebook.com/shwmaesumae2016 ) and Twitter ( @ShwmaeSumae ). With Shwmae Su’mae Day 2016 fast approaching, it looks set to be the best yet. Now in its fourth year, the annual day of celebration will again take place on 15 October. Only a month to go. The day is an opportunity to celebrate the Welsh language in your community, workplace or school. Its purpose is to encourage the people of Wales to start every conversation with Shwmae or Su’mae. Before long, a single Shwmae or Su’mae will turn into hundreds and thousands of Welsh greetings throughout the year. This year, Shwmae Su’mae Day falls on a Saturday for the first time. This means there will be plenty of opportunities to tie in celebrations with recreational activities, be it on the high street, in the playground or on the sports pitch. To ensure they do not lose the opportunity to be part of the fun, workplaces, schools and colleges are encouraged to celebrate on Friday 14 October. Details of events near you and more announcements will follow soon. Follow the hashtag #ShwmaeSumae for regular updates. If you would like to discuss your plans or have your event included on the website, email us.